CONSTRUCTION: Easy cleaning, corrosion resistant stainless steel finish, welded with angle iron and aluminized inner framing. Double wall construction with heavy insulation for cooler operation. Installation clearances for non-combustible surfaces are 6" on sides and 6" in the rear, combustible surface clearances are 6" and 6". OVENS: All ovens measure 20.5" deep by 14" high. Large oven measures 31.5" wide, for the best baking characteristics and results. Medium oven measures 26.5" wide and small oven measures 19.5" wide. Heavy insulation for fuel efficiency, porcelain and aluminized linings for easy cleaning and heat reflection. HEARTH DECKS: Hearth decks hold heat for superior pizza crust and bread browning. Bake directly on the deck with corn meal, in pans or on screens. 2 hearth decks per oven, 3 positions with 2 3/4" between rack positions. Decks are interchangeable with wire racks. BAKING TIMES: 7 to 15 minutes depending on crust and toppings. Call factory for more information. BURNERS: Long life, cast iron “H” pattern burner is combined with a special “V” shaped baffle directing heat for excellent air circulation. Large and medium ovens feature 30,000 BTU, small ovens feature 25,000 BTU burners. CONTROLS: Includes 650° thermostat, 100% safety shut off, automatic standing pilot and brass burner valves. Pressure regulators are set at the factory for the gas specified. Optimal pressures are 4" WC for natural gas and 10" WC for propane. Manifold size is 3/4" NPT. All controls are tested and confirmed in good working order. Calibration and adjustments are the responsibility of the installer. ACCESSORIES: Extra hearth decks, wire racks, gas hoses, flue adapters, draft diverters, carrying handles, knob protectors, matching stands and casters are listed in the price list. 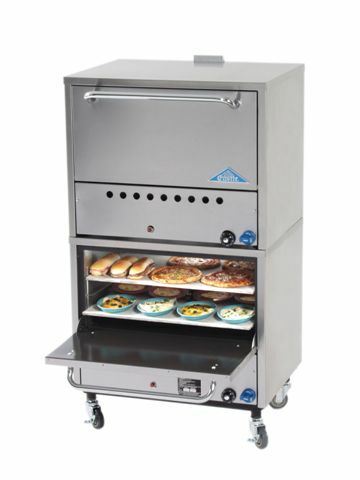 VERSATILITY: Castle pizza ovens are stackable in the field or from the factory. Factory ordered stacking ovens come with a 6" high leg base. Leg base is required when stacking in the field. 3 widths: 24 inches wide frame w/ 19 inch wide oven, 31 inch wide frame w/ 26 inch wide oven & 36 inch wide frame w/ 31 inch wide oven. 300° to 650° thermostat & heat holding hearth decks for superior pizza crust. Easy cleaning, corrosion resistant stainless steel. Welded with angle iron and aluminized inner framing. Welded frame & double wall construction for ruggedness and heavy insulation for cooler operation.